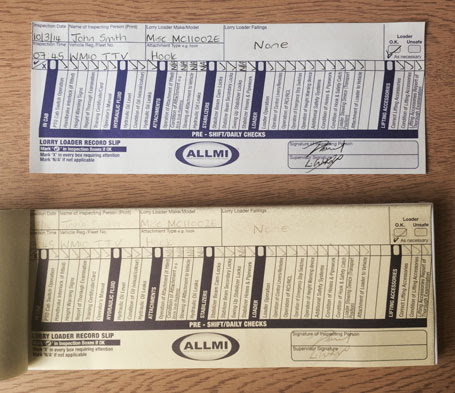 Pre-Operational Check Sheet Pads, each containing 30 duplicate sheets. In each case, the top copy tears out for the operator to keep in the cab. 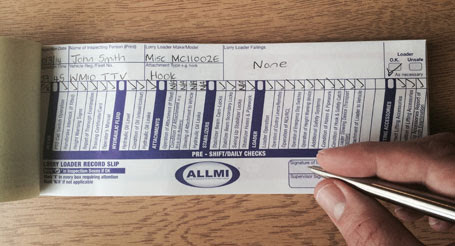 When folded in two, this fits neatly into an ALLMI branded self-adhesive windscreen holder and the reverse of the check sheet then forms a notice in the cab-window, which clearly shows whether the crane has passed its inspection (please see the pictures below).